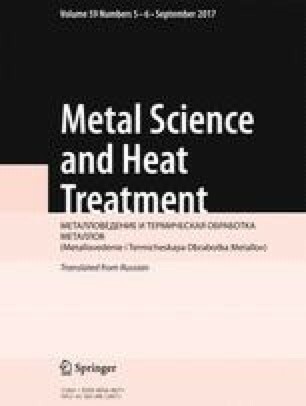 The effect of the chemical composition of alloys of the Sn – Cu – Co system used as a binder for diamond abrasive tools on their structure and hardness is studied. It is shown that in the range of concentrations of the elements studied alloy structure is represented by three phases, i.e., β-Co, a solid solution of tin and cobalt in copper (Cu), and an ε (Cu3Sn) intermetallic phase. The lowest microhardness of the three phases is exhibited by β-Co, as a result of which with an increase in cobalt content alloy macrohardness decreases. Translated from Metallovedenie i Termicheskaya Obrabotka Metallov, No. 5, pp. 58 – 62, May, 2017. Work was performed on equipment of the central usage center “Material science and metallurgy” with state financial support of the Russian Ministry of Science and Education (project unique identifier RFMEF159414X0007, agreement No. 14.594.21.0007).